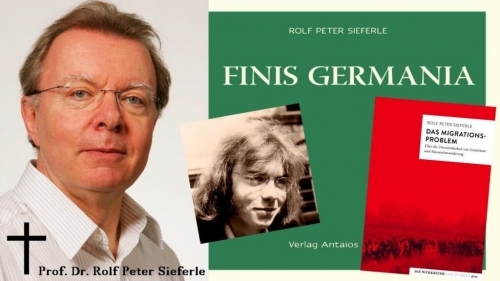 Rolf Peter Sieferle (1949–2016) was a German historical scholar whose posthumously published book Finis Germania set off a moral panic in the summer of 2017. A member of the generation of ’68, he was a radical in his youth, writing his doctoral dissertation on the Marxian concept of revolution. He became a trailblazer in the field of environmental history, best known during his lifetime as the author of The Subterranean Forest (1982). 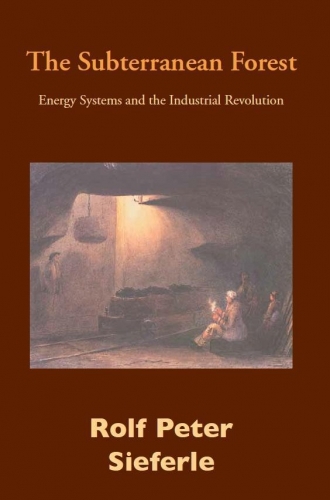 This book examines the industrial revolution from the point of view of energy resources, whereby it appears as a shift from sun-powered agriculture supplemented with firewood to an increasingly intense reliance on coal. The industrial revolution occurred in Great Britain partly because wood was becoming scarce or expensive to transport, whereas coal was plentiful. Although coal is also plentiful in Germany, its industrial revolution came much later because it also possessed large forests near major riverways that permitted inexpensive transportation. The Subterranean Forest is now recognized as a standard work in its field and was published in English translation in 2001. Sieferle wrote or cowrote a dozen other books during his lifetime and was regarded as an entirely respectable member of the German academic establishment. But he moved quietly to the Right as he got older. In 1995, e.g., he published a book of biographical sketches of figures from Germany’s Conservative Revolution, including Oswald Spengler, Ernst Jünger, and Werner Sombart. 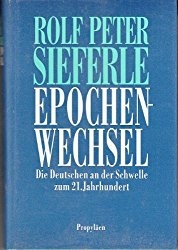 This book and others published during his later years attracted some grumbling from Left-wing reviewers, but Sieferle remained respectable enough to serve as an advisor to the Merkel Government on the subject of climate change. He retired from academic life in 2012. Following the “refugee” invasion of 2015, he quickly produced a political polemic for which he was unable to find a publisher. In September, 2016, Sieferle died by his own hand. It is uncertain to what extent his decision was motivated by failing health or distress over the migrant crisis. 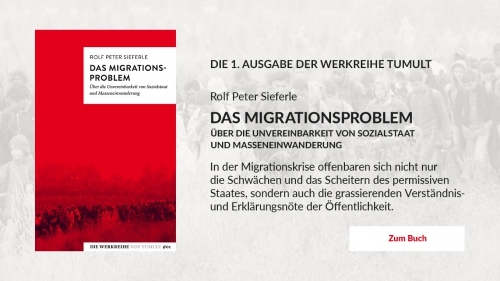 In February of 2017, his polemic was finally brought out as The Migration Problem: On the Impossibility of Combining Mass Immigration with the Welfare State. It is selling well, but the effect it produced has fallen well short of another small work discovered on Sieferle’s computer following his death: Finis Germania, or “The End of Germany.”  This title was brought out by the dissident publisher Antaios, a fact considered scandalous in itself for a former member of the academic establishment. Antaios is the most notorious “Right-wing” publisher in today’s Germany, responsible for bringing out German editions of such unsavory authors as Jack Donovan and the present writer. One of the editors resigned in protest, and the monthly lists were suspended until the rules could be rewritten to make similar occurrences impossible in the future. The book’s unexpected breakthrough turned out to result from a single editor awarding all his points to it: not against the rules, but unusual. The manhunt was on to find the guilty party. He soon made himself known in a letter of resignation as Johannes Saltzwedel, a long-time editor for the newsweekly Der Spiegel and the author of many popular works on German history and literature. He defended his action as “a vote against a Zeitgeist which was abandoning German and European culture in favor of propagating a misty cosmopolitanism.” There are many such cultural conservatives who quietly cultivate their love of Germany’s past while refraining from stirring up a hornet’s nest by publicly violating any of the Left’s numerous taboos; such men are known as “U-Boats,” and Saltzwedel had clearly scored a kill. Finis Germania became a succès de scandale, quickly rising to the top of the bestseller lists. 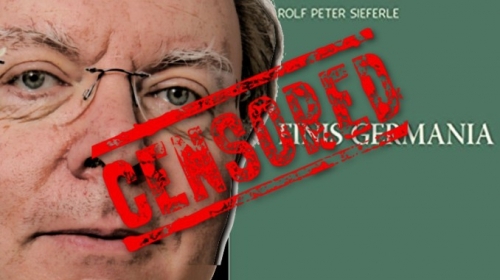 In July it was still at number six on Der Spiegel’s popular list of nonfiction bestsellers before mysteriously disappearing altogether: with no explanation, a gap simply appeared between number five and number seven! But the book had suffered no corresponding drop in sales. 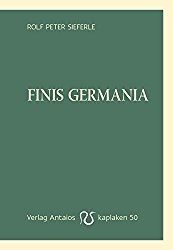 Since this website assumes its readers are competent adults, we shall let them make up their own minds about Finis Germania by publishing selected passages  from the work in English translation, including those which caused the greatest consternation. As many have pointed out, the correct Latin would read Finis Germaniae. 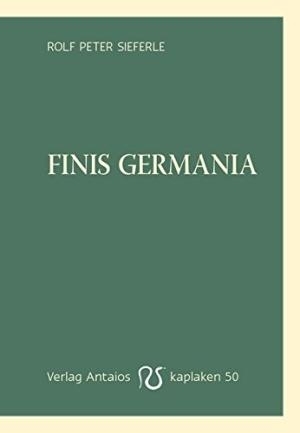 Finis Germania is a very different book from the carefully referenced scholarly works which established Sieferle’s academic reputation. It is a collection of brief personal meditations on what the Germans call Vergangenheitsbewältigung: “overcoming (or coping with) the past,” wherein the past is understood to refer exclusively to the country’s twelve-year National Socialist dictatorship. These meditations were set down beginning in the 1990s, and were last revised by the author in April of 2015, i.e., before the “refugee” crisis of the following summer. Sieferle appears not to have attempted to publish this highly personal work during his lifetime. The book is divided into four sections entitled 1) Finis Germania, 2) Paradoxes of the Age, 3) the Myth of Overcoming the Past, and 4) Fragments. Each of these four main sections is divided into subsections. This first extract consists of three complete subsections from the first main section. Extracts from the third section, which inspired the fiercest denunciations, will follow. No one is surprised that in a semi-Asiatic country like Russia, marked by despotic traditions, the combination of ideology and industry was able to lead to monstrous consequences. The horror of revolution, Civil War, and Stalinism can be unproblematically ascribed to the premodern character of Russia. Still less need we get exited over, for example, the Pol Pot regime in Cambodia—what else was to be expected from a backward Asiatic country? German National Socialism, however, is an entirely different case. Had it not been shown, here in the midst of Europe, that the means of modernity could be applied to quite “barbaric,” i.e., inhumane, ends? If Germany was among the most civilized, cultured of countries, then Auschwitz might mean that the humane “progress” of modernity could at any time change suddenly into its opposite. Thus, at any rate, might a skeptical, pessimistic doctrine from the past be formulated. The standard version of Overcoming of the Past, however, took an entirely different path. Since this path amounted to a direct continuation of the Allied propaganda of the First and Second World Wars, a traditional, premodern Special Path had to be ascribed to Germany, because of which it was fundamentally distinct from the “West.” This had the primary function of unburdening the modern world from the possibility of a holocaust. Germany was declared a sort of Russia, a land with half-barbaric traditions out of which flowed anti-Semitic resentments and hunnish cruelty. Tradition, premodernity, and barbarism could thus be ascribed to the debit side of history; Western Modernity, in contrast, stood forth in spotless robes. From a past construed in such a way, however, nothing more could be learned. As soon as Germany was effectively westernized, the ritual of Overcoming the Past became mere political kitsch, a pure, abstract exercise in righteous (or self-righteous) attitudinizing. It is no longer directed against any real enemy, but instead operates on a purely imaginary front. For the Left, National Socialism meant the greatest imaginable historical defeat. They imagined Europe c. 1930 as on the threshold of a proletarian revolution. The victory of National Socialism was, therefore, the victory of counter-revolution par excellence: it had thwarted the hoped-for transition, as it turned out, definitively and on a world scale. This was simply unforgivable. That it had done its opponents the favor of staining itself with unimaginable atrocities was to some extent a moral bonus for the Left, from which it draws nourishment all the way to the present day by conjuring a permanent antifascism into existence. There are tragic peoples, e.g., the Russians, the Jews and the Germans, upon whom the paradoxes of historical processes are carried out in their full severity. Then there are untragic peoples against whom history runs off like water from a duck’s back. To the latter category belong above all the Anglo-Saxons. Only a country with Great Britain’s unshakable self-confidence could openly declare its oligarchic past the cradle of democracy, from which step by step, with an almost stultifying normality and inevitability, the modern world had developed. Only in its naïve American offshoot could this point of view, cultivated in its country of origin only with a hint of self-mockery, be straight-facedly vulgarized into a Theory of Modernization. We see here a remarkable coincidence between a self-confidence based on success and a historical reality from which one has continually emerged unharmed—with no superfluous revolutions, civil wars, mistaken paths or special paths of all sorts, in triumphant harmony with the march of the world. The remarkable thing is that this tedious victor’s pose is being bandied about as the last word in politically correct thinking in a country where one might from bitter experience have had better knowledge of the complications and messiness of real historical processes. The construction of a German Special Path rests entirely on this Theory of Modernization. This is necessarily the case for purely formal reasons: a “special course of development” is only possible against the background of a normal course of development. Putting this teleological historical hocus-pocus aside, we must accept the fundamental openness of historical situations. If the Spanish had succeeded in 1588, would Drake and Raleigh have stood forth today as unrealistic battlefleet fanatics? Would we be taught the story of the ill-fated British-Protestant Special Path of Development that was fortunately brought back into the normal course of European Christendom? Philipp II as the savior of culture from barbarism? The privateers and buccaneers as lawless pirates and war criminals rightly brought before extraordinary courts and burned at the stake? From the point of view of 1914, similarly, there might have been the real alternative of a German and an Anglo-Saxon Path whereby a German victory might have lead Europe into a different “normality.” However that may be—the victory of the West in 1918 and then again in 1945 definitively laid the German alternative to rest, and thus declared it a Special Path that had been overcome. Comment un journaliste du « taz » a promu involontairement les ventes d’un livre, qu’il jugeait scandaleux, et a offert une notoriété immense à son auteur décédé. 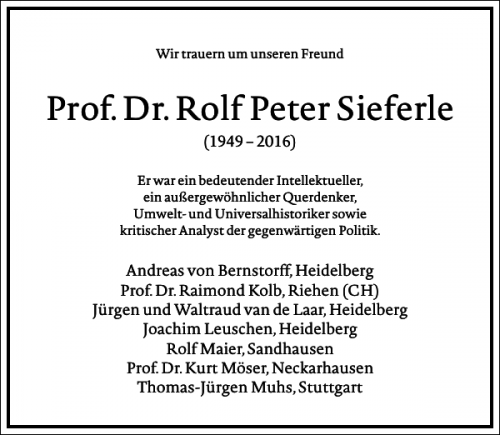 Rolf Peter Sieferle est ainsi devenu un auteur à succès post mortem. Avant qu’il ne se soit donné la mort le 17 septembre 2016 à Heidelberg, le nom de Rolf Peter Sieferle n’était guère connu, sauf dans un cercle d’amis et de collègues assez restreint. Pourtant, ses collègues et ses lecteurs, peu nombreux, savaient qu’ils avaient affaire à l’un des derniers « savants universels », celui qui avait exploré jusqu’aux moindres détails l’histoire de la nature et des techniques depuis le paléolithique jusqu’à nos jours. Tout au début de l’été 2017, son nom, tout d’un coup, fait la une des journaux après que l’on a appris qu’il avait publié un petit livre auprès des éditions « Antaios », intitulé Finis Germania. Ce petit volume rassemble des textes qu’il avait laissés dans un tiroir avant de se suicider. Le livre figurait sur la liste des « ouvrages du mois » en juin. Cette liste est dressée par les critiques littéraires allemands, sous le double patronage de la radio « Norddeutscher Rundfunk » et du quotidien Süddeutsche Zeitung. Brusquement, les auteurs se sont rendus compte qu’ils avaient recommandé un ouvrage publié par une maison d’édition qu’ils estampillaient habituellement d’« extrême-droite ». Qui donc était ce Rolf-Peter Sieferle ? Né le 5 août 1949 à Stuttgart, il étudiera ultérieurement l’histoire, les sciences politiques et la sociologie à Heidelberg et à Constance. A l’époque de ses études, Sieferle se sentait proche du mouvement de 68. En 1977, fidèle à cette option socio-politique, il rédige une thèse de doctorat intitulée Die Revolution in der Theorie von Karl Marx et la soumet à la faculté de philosophie de l’université de Constance. En 1984, toujours dans la même université, il soumet une seconde thèse de doctorat en histoire contemporaine. Deux ans auparavant, Sieferle avait publié un ouvrage qui avait immédiatement fait fureur, Der unterirdische Wald (= La forêt souterraine). Ce livre fit de lui un spécialiste incontesté d’une nouvelle discipline, l’histoire de l’environnement, l’histoire d’un point de vue écologique. Dans ce livre, Sieferle concluait que sans l’usage intensif des énergies fossiles, en l’occurrence le charbon, la révolution industrielle aurait démarré bien plus lentement mais se serait déroulée sans les âpres luttes sociales qui sont à la base des crises des 19ème et 20ème siècles. Deux ans plus tard, l’année de son deuxième doctorat, Sieferle publie un nouvel ouvrage Fortschrittfeinde ? 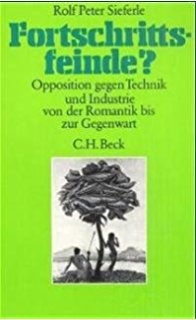 Opposition gegen Technik und Industrie von der Romantik bis zur Gegenwart (= Ennemis du progrès ? L’opposition à la technique et à l’industrie du romantisme à nos jours). Ce livre constitue le premier vrai travail, solidement étayé de références, sur l’histoire du mouvement de protection de la nature en Allemagne. A partir de 1989, il obtient un poste de « Privatdozent » à l’université de Mannheim, qui devient, à partir de 1991, un professorat extraordinaire. En 1994, il se fait remarquer pour l’excellence d’un solide essai, même auprès des vertueux autoproclamés de service : Epochenwechsel : Die Deutschen an der Schwelle zum 21. Jahrhunderts (= Changement d’époque : les Allemands au seuil du 21ème siècle). Sieferle explore le « champ de bataille de l’histoire » qu’est son pays pour conclure que la situation y est toujours aussi explosive et dangereuse après la chute des régimes communistes. Dès le milieu des années 1990, Sieferle critique l’immigration en avançant des arguments que l’on retrouvera dans les écrits posthumes qui font aujourd’hui scandale. Dans cet ouvrage d’il y a plus de vingt ans, Sieferle écrivait déjà : « Le lobby allemand pro-immigration, qui s’étend dans la société depuis le juste milieu libéral de gauche jusqu’à certains milieux liés aux églises et aux sectes radicales tiers-mondistes », crée une situation en se référant à une rhétorique sur les droits de l’homme, « tout en en ignorant les conséquences politiques de la manière la plus stupide qui soit ». Ainsi, poursuivait Sieferle dans les années 1990, « si cette immigration de masse se poursuit au même rythme, certains groupes de migrants deviendront des minorités culturelles ou nationales, avec pour corollaire logique qu’ils exigeront des droits particuliers ». L’erreur fondamental, commise par ce lobby pro-migrants, est la suivante : il part a priori du principe que les immigrants finiront par s’assimiler au modèle et aux valeurs de l’Occident, soit à l’« universalisme humanitaire », qui, lui-même, est une particularité et non un jeu de valeurs universelles, que les masses immigrantes vont finalement réduire à une position minoritaire. Pour les Allemands qui vivent dans leur propre pays, la situation pourra devenir dramatique dans un futur proche. Sieferle : « Pour les universalistes humanitaires, cela n’a aucune importance de savoir qui s’installe en Allemagne car, pour eux, l’Allemagne n’a plus aucune signification ». Ce mouvement en faveur de l’immigration, poursuit-il, est finalement « un facteur de dissolution de l’Etat social en tant qu’Etat national et d’autodestruction culturelle ». Car, s’aperçoit Sieferle, « une immigration de masse a pour conséquence logique qu’il y aura de moins en moins à partager ». « Le mouvement pro-immigration ne peut plus demander qu’une chose aux populations des zones où règne le bien-être matériel : exiger d’elles sur le plan éthique qu’elles partagent leurs acquis matériels, qu’elles ont accumulés en travaillant, avec les zones où règne la pauvreté, tout en s’exposant sans résistance à la concurrence des immigrés sur le marché du travail et tout en alimentant ces derniers par le biais de l’Etat social ». Ce livre de Sieferle mérite la lecture aussi parce qu’il réclame explicitement une réorientation politique générale de la République fédérale vers un modèle d’ordre politique inspiré par le « socialisme prussien ». Ce type de socialisme devait aussi aider les populations d’Allemagne, surtout d’Allemagne de l’Est, à surmonter les problèmes socio-économiques liés à la récente réunification. En effet, le chômage restait (et reste…) élevé dans les nouveaux Länder qui, jadis, faisaient partie de la RDA socialo-communiste.Il fallait nécessairement y assainir l’industrie et y construire des infrastructures nouvelles. L’élimination de tout le ballast inutile de la gestion socialo-communiste nécessitait de l’Etat un rôle plus actif que celui que préconisent les doctrines libérales en vigueur à l’Ouest. Pour Sieferle, la réunification de 1990 postulait une « re-continentalisation » de l’Allemagne et, par voie de conséquence, la nécessité de «penser à faire coïncider deux courants », notamment « la redistribution nationale et la solidarité, d’une part, et, d’autre part, une économie marquée par un haut degré d’interventionnisme étatique ». Sieferle en arrivait à la conclusion dès le milieu des années 1990 : « La combinaison de ces deux facteurs correspond au vieux programme du socialisme prussien ou national ». Une certaine Suzanne Gaschke, journaliste à la Frankfurter Allgemeine Zeitung, reprochait à Sieferle, déjà à l’époque, « de vouloir donner le coup de grâce à l’universalisme moralisant et valétudinaire ». Fielleuse, elle ajoutait « que chaque sou donné pour l’achat de ce bouquin était un sou de trop ». Sieferle ne s’est pas laissé impressionner par les commentaires de cette journaliste hostile : au contraire, il a immédiatement décidé d’approfondir l’idée du « socialisme prussien ». En 1995, il publie une étude sur le sujet : Die konservative Revolution. Ein Essay. Ce livre est constitué d’une série de portraits : Paul Lensch, Werner Sombart, Oswald Spengler, Ernst Jünger et Hans Freyer. Dans sa conclusion, Sieferle définissait la « révolution conservatrice » comme « l’ébauche d’une alternative à la modernité ». 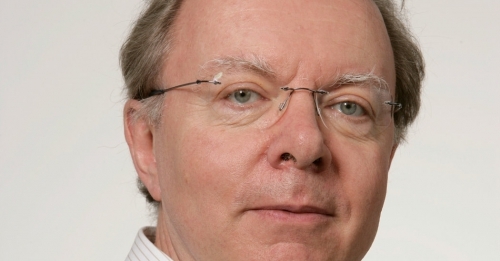 Aussitôt, un journaliste connu, Siegfried Jäger de « l’Institut de Duisburg pour les Recherches en linguistique et en questions sociales », tout de suite après la parution du livre, devine, derrière les propos de Sieferle, posé comme « un disciple de Nolte », de « vouloir gommer l’ombre nazie qui planait sur ses auteurs préfascistes favoris ». Ces petites attaques ponctuelles n’ont nullement nui à la carrière universitaire de Sieferle dans les années 1990. En 2000, il est nommé à la célébrissime université de Saint-Gall. En 1997, il publie un autre livre remarquable : Rückblick auf die Natur. Dans ce volume, Sieferle cherche à faire prendre conscience à ses lecteurs qu’en Amérique du Nord et en Europe un «archipel industriel » a émergé mais est exposé à subir de graves dangers du fait que les « structures techno-économiques » s’y soustraient de plus en plus à « la gouvernance assurée par les Etats nationaux ». Les brillantes analyses de Sieferle, reposant sur un savoir stupéfiant, trouvaient des lecteurs anonymes et discrets toujours plus nombreux. Mais cela restait relatif. Ses lecteurs se sont multipliés paradoxalement depuis son suicide à l’automne 2016. En 2005, Sieferle avait un article dans la revue Tumult, jadis organe de la gauche non orthodoxe. Cet article traitait de la crise des réfugiés, qui prenait des proportions de plus en plus incontrôlables. Cette immigration soudaine et massive aurait pour résultat rapide de mettre un terme au monopole de la violence, normalement détenu par l’Etat. Ce monopole s’amenuiserait graduellement pour faire place à des « droits tribaux », gérés par les multiples groupes de migrants. Inutile de préciser qu’avoir émis cette hypothèse faisait automatiquement de Sieferle un dissident, un contestataire inassimilable. Dans les écrits qu’il a laissés après sa mort, il tape encore sur le clou, notamment dans un texte intitulé Das Migrationsproblem : Über die Unvereinbarkeit von Sozialstaat und Masseneinwanderung (= Le problème de l’immigration. Du caractère irréconciliable entre l’Etat social et l’immigration de masse). Ce texte constituait le premier volume d’une série qu’entendaient publier les éditeurs de Tumult (la série « Werkreihe Tumult »). Sieferle constatait qu’il était impossible de consolider l’Etat social tout en maintenant ouvertes les frontières. Mais tout cela ne provoqua pas encore de débat sur ses travaux. Il a fallu attendre l’article d’un journaliste connu du « taz », Andreas Speit. Dans son journal, Speit exprima son indignation de voir qu’un volume des éditions « Antaios » avait été primé en 2017 par une mention dans la liste des meilleurs livre de « non fiction ». Ce volume, c’était Finis Germania. Du coup, le zèle de l’inquisition s’est mis en branle : on a cherché fébrilement à savoir quel insolent avait osé placer ce volume sur la liste des bons livres à lire. Généralement, les recommandations sont anonymes. Finalement, on a trouvé le « coupable » : c’était un rédacteur du Spiegel, Johannes Salzwedel, qui avoua que cela avait été grâce à ses voix que le livre avait été placé en neuvième position sur la liste. Mais le méchant travail des inquisiteurs eut, cette fois-ci, un effet contraire à celui qu’ils avaient escompté, suite à l’indignation du journaliste Speit. Un débat public et animé s’ensuivit, avec, pour objet, la présence de ce volume hérétique dans la liste des bons livres. Ce débat fit que le livre arriva en première place dans les ventes d’ « amazon.com », même que cette multinationale du livre avait ôté de ses stocks tous les livres de l’éditeur « Antaios », suite à une première vague d’épuration. Les chiffres mirobolants des ventes sont donc dus exclusivement aux ventes d’offreurs secondaires qui utilisent partiellement « amazon.com ». Toute la campagne des inquisiteurs eut pour effet que Sieferle a enfin trouvé post mortem le vaste public que méritaient ses publications et qu’elles n’avaient jamais trouvé de son vivant. Le petit volume Finis Germania, publié dans la collection Kaplaken de l’éditeur « Antaios » est un concentré de l’œuvre de son auteur : il a la brièveté dense des aphorismes, il est succinct et clair, il vise l’essentiel. Les titres des chapitres résument à eux seuls déjà toute la pensée de l’auteur : « Voie allemande et perspective des vainqueurs » ; « La nouvelle religion d’Etat » ; « La logique de l’antifascisme ». Le petit volume résume bien le grand livre de Sieferle, Epochenwechsel (cf. supra) de 1994. La densité et la brièveté de ses réflexions conviennent bien à un vaste public. Ce qui me permet de terminer avec une tirade d’humour noir à l’adresse du sieur Andreas Speit : celui qui creuse la tombe de son voisin, y choit lui-même ! (article paru dans « Deutsche Stimme », août 2017). Rolf Peter Sieferle, Finis Germania, Reihe kaplaken, Ed. Antaios, Schnellroda, 104 p., 8,50 euro. 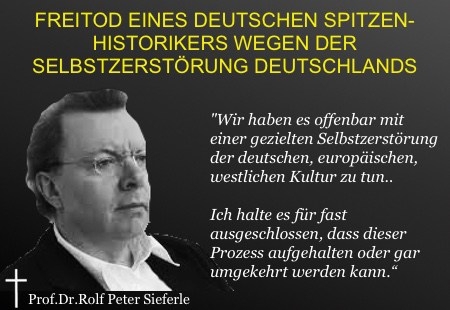 Der Historiker Rolf Peter Sieferle hat im September 2016 den Freitod gewählt. Sein umfassendes Werk harrt noch immer einer angemessenen Rezeption. Unter mehreren posthum publizierten Schriften befindet sich ein Band, welcher 31 skizzenartige Darlegungen vereint. Um Deutschland geht es. Um Geschichte und Gegenwart, Bewertungen, Perspektiven, Politik, Anthropologisches und Philosophisches. Es sind, je nach Standpunkt, Provokationen oder wohltuende, sachlich-argumentativ unterfütterte Ansichten. Der Titel „Finis Germania“, welcher den Lateiner zunächst stutzen lässt, ist bewusst gewählt. Die vor Jahren verfassten, aber nichtsdestotrotz für die Gegenwart aktuellen Texte enthalten viele Thesen, geeignet als Ansatzpunkte für fundierte Ausarbeitungen. Liberale Demokratie und technische Moderne sind, wenn auch durch Wissenschaft und Politik anders postuliert, für Sieferle nicht zwingend miteinander verbunden. Er weist darauf hin, dass es gerade in einer modernen Welt zum Holocaust gekommen ist – eine Tatsache, die dem Glauben an einen positiven Fortschritt per se oder gar an eine „irreversible Entwick-lung der Moral“ stark den Wind aus den Segeln nimmt. Auch der vielfach in der Geschichtsschreibung aufgenommene Terminus vom „deutschen Sonderweg“, der mit dieser Problematik eng verknüpft ist, lasse sich allein mit dem Hinweis darauf relativieren, dass er die Annahme eines „Normalweges“ voraussetze. Dieser wiederum sei abhängig vom Definierenden und damit ebenso hypothetisch wie an Zeit und persönlichen Standort gebunden. Für Sieferle ist Verantwortung individuell zu betrachten. Schuldkategorien seien eine Frage des Strafrechts, nicht der Geschichte. Gegen Kulturlosigkeit der gegenwärtigen politischen Klasse zieht er zu Felde und konstatiert, historisch und parteiübergreifend, einen deutschen Hang zum „Sozialdemokratismus“. Der den Menschen verändernde Verlust der Kulturlandschaft, welche weit mehr als eine geografische Kategorie sei, wird angeprangert. Sieferle glaubt, dass der öffentliche Umgang mit dem durch den Terminus „Vergangenheitsbewältigung“ charakterisierten Komplex dem vorgegebenen Anliegen alles andere als dienlich sei. Konformitätsdruck, erkenntnislähmender Moralismus sowie der dogmatisch-doktrinäre und erstaunlich widersprüchliche „Antifaschismus“ stehen seiner Meinung nach einem wirklich freien Diskurs unverrück-bar im Wege. Bezüglich der Zukunft der von ihm analysierten und geschätzten Werteordnung war Sieferle tief pessimistisch. In einem Jüngerschen „Waldgang“, einer inneren Emigration, sah er keine Lösung für sich. Dem weiteren ohnmächtigen Verfolgen der seiner Meinung nach verhängnisvollen Wege der deutschen Gegenwart hat er das vorzeitige Ende seiner physischen Existenz vorgezogen.